ALBANY — D’oh! For local fans of longtime prime-time TV series “The Simpsons,” it can be hard to believe that the show is approaching its 30th anniversary this December. But it’s even more surprising that they can meet one of its most important behind-the-scenes figures much sooner in Albany. Mike Reiss, acclaimed TV comedy writer and the show’s longest-serving writer and producer, is scheduled to speak about his craft and “Simpsons” work on Friday, Feb. 8 at 7:30 p.m. at Page Hall on 135 Western Ave. in Albany at the University at Albany’s Downtown Campus. This event is free and open to the public, and organized by the New York State Writers Institute. 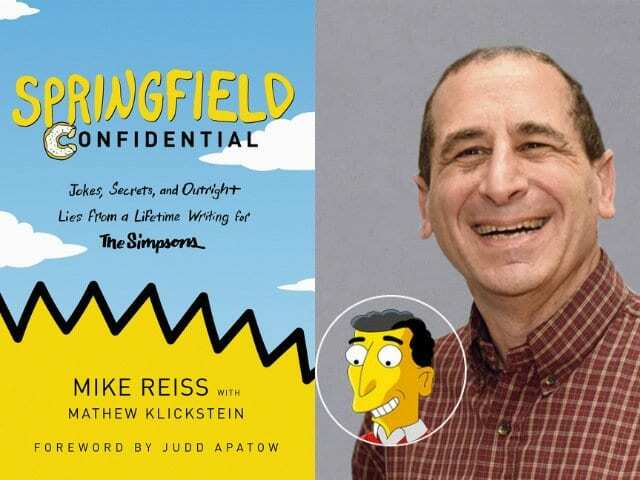 Reiss would also discuss his 2018 book and fan guide, “Springfield Confidential: Jokes, Secrets and Outright Lies from a Lifetime Writing for The Simpsons,” which offers insight into the show’s production team’s creative process and includes interviews with his writing, animating, and acting colleagues as well as celebrity guests. 1993, Reiss has periodically returned to work on the show, even co-writing the screenplay for its 2007 feature film, “The Simpsons Movie.” For his work, Reiss won four Emmy Awards. “The Simpsons” has long remained a cultural phenomenon both nationally and internationally, even becoming known for predicting a few major events. A 1998 episode titled “When You Dish Upon a Star” foresaw Disney buying movie studio 20th Century Fox which happened in 2018; a March 2000 episode called “Bart to the Future” predicted that Donald Trump would become president; and a 2010 episode named “Boy Meets Curl” prophesied that the U.S. Men’s Olympic Curling Team would win a gold medal and beat Sweden — this exact result occurred at the 2018 Winter Olympics in PyeongChang, South Korea. “That’s it, we’ve got three things right in 30 years, you get one thing right every decade and it makes us some of the best psychics in America,” Reiss joked in an MSNBC interview, notably sporting a yellow tie, in late July 2018 while promoting his book. He added that he recalled when the very first episode debuted on Dec. 17, 1989, the show’s network did not have much faith in it, believing that it would only run for six weeks before cancelation. Reiss and his colleagues were holding a “Premiere Party” at a bowling alley where the episode was being broadcast on a TV screen above them, not yet realizing that critics had begun perceiving it as a “game changer” type of show. “The next morning, we found out that we debuted with the highest ratings in the history of the Fox network, so it took a half-hour to take America by storm,” he said. The figure was a staggering 26.7 million viewers. Despite since falling to an average of four million viewers per season now, Reiss’ creative input has still helped “The Simpsons” reach its 30th season and over 650 episodes now while a second feature film is in the works.